Warning, this may be a duplicate post. We all agree we’ve seen this before, but can’t find it in our archive. If it is, sorry. If it isn’t enjoy one of the most awesome projects we’ve seen in a long time. Meet [Jaimie Mantzel] an eccentric, and very hyper, individual. He’s done many projects, but this one in particular stands out as being quite ambitious. [Jaimie] is building a giant hexapodal walker that he can ride in. Dubbed simply “Giant Robot”, the 12 foot tall and 18 foot wide robot began construction in 2007. This individual is so full of energy, you’ll get tired just watching his videos. We’ve included, below, his introduction video as well as the video where his giant robot takes its first steps. Note that there are 67 videos of the build process. Unfortunately, as of the last video in January 2011, the robot is unfinished. Don’t worry though, we know [Jaimie] is still alive. We saw him recently coming up with cool toy ideas. 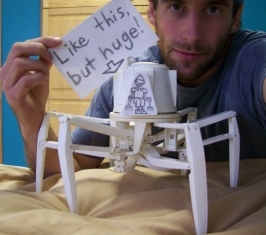 If this has left you with an insatiable craving for a video of a fully functional giant walking hexapod octopod, don’t forget about mondo spider.